Wednesday was almost a case of rinse and repeat. 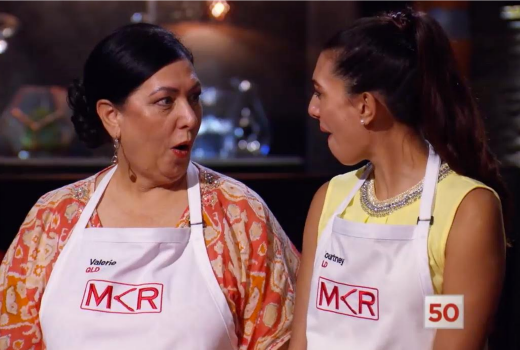 MKR again topped the night but Nine again claimed the highest share, just as both did on Tuesday. My Kitchen Rules pulled 1.24m viewers as Valerie & Courtney locked into Sunday’s grand final, ahead of The Voice blind audition on 1.08m viewers. At 370,000 The Graham Norton Show trailed 7:30‘s 514,000. At 9pm fortunes flipped. The season premiere of Britain’s Got Talent trumped Seven’s newcomer Aussie Property Flippers. Elsewhere Charlie Pickering was nearly double former colleague Peter Helliar -just 261,000 tuned into TEN’s special despite his Gold Logie nomination. Nine network won Wednesday with 32.9% then Seven 30.0%, ABC 15.2%, TEN 14.6% and SBS 7.3%. The Voice led for Nine with 1.08m viewers then Nine News (1.04m / 993,000), A Current Affair (872,000), Britain’s Got Talent (671,000) and Hot Seat (538,000 / 291,000). My Kitchen Rules was #1 with 1.24m then Seven News (1.05m / 1.03m), Home and Away (743,000), The Chase (612,000 / 389,000), and Aussie Property Flippers (548,000). ABC saw ABC News (792,000), Anh’s Brush with Fame (565,000), The Weekly with Charlie Pickering (525,000), 7:30 (514,000), and You Can’t Ask That (442,000). The Warriors drew 250,000. Adam Hills: The Last Leg was just 164,000. The Project (579,000 / 390,000) was best for TEN then TEN Eyewitness News (509,000), The Graham Norton Show (370,000), Family Feud (346,000). Peter Helliar: One Hot Mess drew just 261,000 well down on This is Us numbers. On SBS it was The Night Manager (219,000), Digging for Britain’s Secrets (200,000), Testing Teachers (187,000) and SBS World News (144,000). Peter Rabbit again topped multichannels with 249,000. New low for The Voice and MKR down 450k on last years semi. Channel 7, never forget what happened with Aussie BBQ Heroes in late 2015. All they could say is Aussie Property Floppers! Both Ch9 + Ch7 need Ch10 to have strong content to rate well. (only assisted by Ch7 Perth viewers) then to have Ch9&10 open the door for 2 weeks allowing MKR a free run. Hopefully next year they will not be so kind. The second ep of The Young Pope was an improvement over the first. Not enough to make me want to binge the rest of the series but I’ll tune in again next week. Really enjoying Olivia Colman’s performance again in The Night Manager. Also appreciating Elizabeth Debicki more this time around. David, is it customary for the BBC to sell ‘cut down’ episodes of a series like “The Night Manager” to networks like SBS who insert about 15 minutes of commercials – or has SBS taken it upon themselves to re-edit the show? TNM was filmed as 6 x 59 minute episodes making up the series. But SBS is screening edited versions (43 mins of content) which have stretched out the series by an additional 2 or 3 episodes. Just compared the episode b’cast last night and found it to be 3/4 of ep 5 and 1/4 ep 6! And the “final” episode is scheduled to be telecast next Wednesday!!! I believe it has happened in the past. I will ask. Oh yeah. I meant to say something about this two weeks ago. Was trying to find out where I was up to with my catch-up and couldn’t reconcile the SBS eps with the originals. I haven’t noticed anything missing altho’ I can’t be bothered checking thoroughly. At least the newly formatted eps seem to end at an appropriate point. So the edits appear to have been done with some care. Thanks for asking, David. Makes sense given SBS has in-program commercials and helps explain why each ep hasn’t finished at a weird point and ad breaks have not been jarring in terms of interrupting the narrative. To drop nearly 700,000 viewers from MKR is a bit of a worry…especially when House Rules will be the lead in next week, which tends to start soft.